As they have tried to gather enough support to get their health care bill passed, Republican lawmakers keep adding pots of money to the proposal to pay the costs of people with high medical costs. The cash would very likely go to "high-risk pools," which pay the expenses of the very sick so that insurance companies don't have to. The AHCA is the latest in a long line of attempts to transform the health care system. Those that have passed include Medicare, then Medicaid, and then Obamacare. Now we move to Trumpcare, or whatever it eventually is labeled, which seems to be turning into another big federal program to pay the bills for people with expensive illnesses. House Speaker Paul Ryan made the case for high-risk pools on the Charlie Rose television show in January. 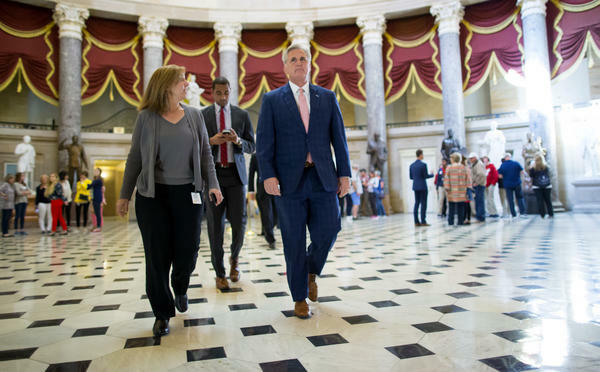 "By having taxpayers, I think, step up and focus on, through risk pools subsidizing care for people with catastrophic illnesses, those losses don't have to be covered by everybody else [buying insurance] and we stabilize their plans," Ryan said. The original version of the House bill, called the American Health Care Act, includes a "Patient and State Stability Fund" with $100 billion over 10 years that would allow states to help defray their citizens' health costs or lower their premiums. Later amendments added an additional $30 billion to create a federal "invisible" high-risk pool, with money to reimburse insurers who cover patients with expensive illnesses and to pay for prenatal and childbirth care. And on Tuesday night, Rep. Fred Upton, R-Mich., proposed adding an additional $8 billion over five years to ensure that sick people get adequate coverage through high-risk pools. "It's our understanding that the $8 billion over the five years will more than cover those that might be impacted," Upton said Wednesday after a meeting at the White House. "And as a consequence, [it] keeps to our pledge for those that in fact would be otherwise denied because of pre-existing illnesses." Ryan says the goal of the Republican bill is to offer more and cheaper health insurance choices. By separating out those who have expensive medical conditions, the remaining customers for individual insurance could buy stripped-down policies with fewer benefits at a lower price. Several states have tried high-risk pools in the past, but they were typically underfunded, leaving millions of people with no access to adequate health care. Lawmakers hope that by putting the heft and money of the federal government behind them, they may work better. The federal government is already in the business. It pays for the health care of more than 40 percent of the population, through Medicare, Medicaid, the military and the Department of Veterans Affairs, according to the Census Bureau. Medicare is essentially a giant high-risk pool. The program, which pays for health care for people over 65, was created in 1965 because that population couldn't get affordable private health insurance precisely because their health costs were too high. Last year the federal government spent about $591 billion on Medicare, according to the Kaiser Family Foundation. Medicaid, which covers the poor or disabled, is essentially another high-risk pool, paid for with about $550 billion in tax money in 2016. And then there's the Veterans Health Administration, which pays for the care of many people who have served in the military. Covering the people that commercial insurance left behind was also the goal of the Affordable Care Act. The law was designed to ensure that people in the individual insurance market who have pre-existing medical conditions, who were often shut out of traditional insurance plans, could get coverage. Obamacare tries to achieve that goal by requiring everyone, sick and healthy, to buy insurance so that the cost is spread among a broad population. That led to higher premiums for many people who are young and healthy because they subsidize those who are sicker and older, and also because they have to buy insurance with a generous menu of benefits mandated by the government. The Republican plan aims to cut those premiums by getting rid of Obamacare rules requiring that policies offer a broad menu of benefits, including prescription coverage and maternity care; limit how much more companies can charge older people; and require insurers to charge the same price for people with existing medical conditions. But many Republican members of Congress, including Upton, aren't willing to see those with more medical needs shut out of the system once again. "We're talking about some way to finance a social goal that was established by the Affordable Care Act," says Joe Antos, a resident scholar at the conservative American Enterprise Institute. "I don't think Republicans want to go back on that. They agree that we've turned that corner." Antos says the big difference between what's being contemplated by the House Republicans this week and Medicare or other government health programs is that high-risk pools or subsidies would very likely still be run through private health insurers, which have incentives to save money and be efficient. Zack Cooper, a professor of health policy and economics at Yale, agrees. "Once you've decided to cover everybody, you're sort of arguing over where the money comes from," he says. "The ACA makes me subsidize you. The high-risk pools are simply doing that through taxation." So far the House GOP bill doesn't require states to create high-risk pools, but some of the money is allocated specifically to that purpose. Such pools could be separate state-run insurance programs similar to traditional Medicare or Medicaid, or "invisible" systems where individuals buy their insurance on the regular market but the government pays the expenses of the people deemed high risk. Maine has an invisible risk pool where insurance companies have to turn over to the state 90 percent of the premium paid by anyone the company deems high risk. That prevents companies from abusing the high-risk status, Antos says, because insurers would be forgoing income from patients who don't have high medical costs. After Maine established its high-risk pool, premiums for people in their 20s fell an average $5,000 a year, and people in their 60s saw their costs decline by about $7,000. At the same time, enrollment in private insurance rose, according to a study in Health Affairs. The Republican bill doesn't mandate a Maine-like system. And the flexibility in the bill, combined with limits on the money available, could be a problem, says Linda Blumberg, a senior fellow at the left-leaning Urban Institute. Especially since the pot of money is limited. "We're going to provide X dollars, then we'll let the states figure out what benefits they can get for these people for the money that we're providing," Blumberg says. Emily Gee, a health economist at the Democrat-allied Center for American Progress, says the Republican proposal needs about $20 billion more per year to adequately pay the costs of high-risk patients. And that's a real risk, says Yale's Cooper. Government has a track record of creating programs to help the needy but not funding them adequately to ensure that they offer quality services, he says. It's a common complaint about Medicaid, where lawmakers frequently point out that it doesn't pay doctors enough. "This is trying to get people off the books," Cooper says. "The fear is once you get them off the books, you forget about them."